Like TRULIGN™, Crystalens is made by Bausch & Lomb, one of the most respected names in eye health for more than 150 years. That’s important to us at Boutique Eye Orlando since we wouldn’t trust your eyes to just anyone. Also like TRULIGN™, Crystalens is an accommodating lens, so it moves with the natural movement of the eye to improve your range of vision. Crystalens is the first lens of its kind and Dr. Brian Haas was one of the first ophthalmology cataract surgeons to insert this premium lens. It was modeled after the human eye, so it’s designed to more perfectly replicate the eye’s natural movements and abilities, and it comes so close to the natural function of the eye that it became the first and only FDA-approved accommodating intraocular lens (IOL). It’s also the only FDA-approved IOL that uses the eye’s natural focusing ability to create better, more dynamic vision. The Crystalens actually uses the eye muscle to flex and accommodate to the movement of the eye, so it can focus on objects at all distances. It works in perfect synchronicity with your eye. Because of this breakthrough, not only is Crystalens the first FDA-approved accommodating IOL, but it also corrects presbyopia, a condition that often accompanies cataracts and makes it hard to see at near and intermediate distances. It does this by providing a single focus point throughout a continuous range of vision. Because Crystlens replicates the natural conditions of the eye, Crystalens patients rarely need glasses. In clinical trials, an astounding 88.4 percent of Crystalens patients could see better at all distances. For standard IOLs, only 35.9 percent could say that. It produces a brighter and clearer vision across a range of distances, so you can see as clearly as you could when you were younger. It broadens your range of vision. It helps maintain the clarity of your vision. 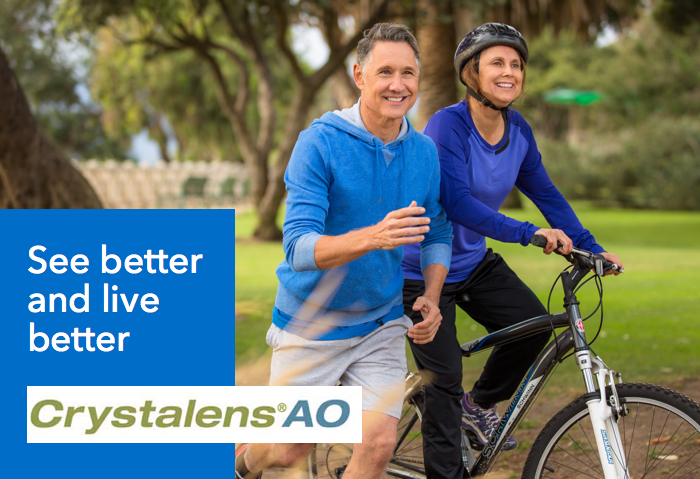 Simply put, the Crystalens treats cataracts and presbyopia and gives you a fuller, more natural range of vision. Of course, all the clinical trials in the world don’t mean anything until you see the difference for yourself. And, like any procedure, Crystalens may not be right for everyone. If you think you might benefit from a Crystalens IOL, get in touch. Dr. Brian D. Haas in Orlando, Florida will assess your specific needs and make sure you know all of the options available to you. If the Crystalens is a good fit, you’ll be on your way to clearer vision from almost any distance.